Brandon Routh (Superman Returns) stars as Dylan Dog, a supernatural detective who will go where the living dare not — facing friend and foe alike in the monster infested backstreets of New Orleans. Armed with an edgy wit and an arsenal of silver and wood-tipped bullets, Dylan must solve a series of murders before an epic war ensues between his werewolf, vampire and zombie clients. Based on one of the world's most popular comic books (over 60 million copies sold), this inventive horror comedy will slay you with humor and genuine frights. Download Dylan Dog: Dead of Night in Digital HD from the iTunes store. 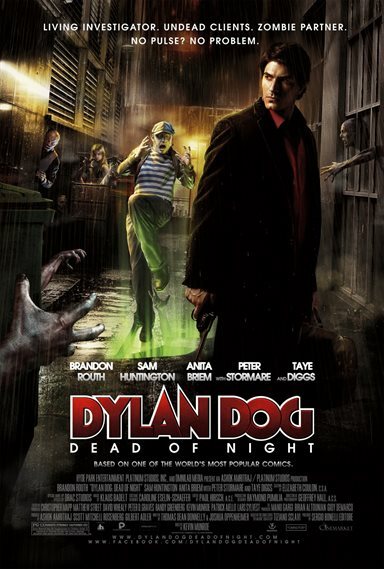 Dylan Dog: Dead of Night images are © Hyde Park, Platinum Studios, Freestyle Releasing. All Rights Reserved. Dylan Dog stars Brandon Routh as a private investigator charged with the task of investigating the crimes of the supernatural. Long ago all of the creatures of the night decided to appoint a single human as their "sheriff", a neutral party to keep the peace and deal out justice. The film opens on a large Louisiana mansion where a young named Elizabeth (Anita Briem) is preparing dinner for her father. As she is finishing up she notices some red liquid on one of the dinner plates. Upon inspection she realizes its blood and it is dripping down through the ceiling. She rushes up the stairs to her father's study where she finds him dead on the floor, torn to pieces. Before she has time to call the police a large animal rushes past her and leaps out the window. We then jump to our main character, Dylan Dog (Brandon Routh) who is awoken by a distraught husband holding a gun to his face. Dylan has taken some photographs of the husband with his secretary and now the man wants revenge. Dylan, having seen worse things in his time, is unperturbed by the man's ravings. Instead Dylan offers his services because it turns out the man's wife cheated on him first. As he leaves, Dylan's errand boy Marcus (Sam Huntington) comes in with this week's latest dirty photos. He has been working with Dylan for some time now and wishes to be promoted to his partner since he has more than proven himself. Dylan is unwilling to place his trust in someone again for fear of losing them. You'll find out later that Dylan was engaged once while still in service to the supernatural, but she was killed and in a fit of rage Dylan slaughtered all of the elder vampires. Since then he has been retired from that world, working only for mortals. Marcus unknowingly drags Dylan back to that life when he takes a job from Elizabeth whom has had no help from the local police in finding her father's killer. Dylan wants no part of that old life though and refuses the case. His hand is forced when Marcus is killed in their office, a victim of a zombie attack. He dons his old clothes and heads back to Elizabeth's house, since that is the best place to start. He discovers her father was killed by a werewolf belonging to one of the older packs in the area. When he interrogates the leader of the pack, Gabriel, played by Peter Stormare, he only succeeds in angering him. His next stop is the dance club Corpus House owned by the head vampire Vargus (Taye Diggs) but he is of no help either since Dylan's return to his old job can only hamper Vargus's plans to take over. It seems there is an ancient relic called The Heart which is a cross with the blood of a powerful demon within it. This blood, when infused with a member of the undead, would resurrect this demon and bring about the end of humanity. As more and more clues come to light it becomes clear that Dylan has no choice to return his old life and maintain the balance between the many sects of the supernatural. The film on a whole is nothing to get excited about, the special effects aren't very good and the story itself seems to be a mash up of many different films and TV shows that have come before. Brandon Routh clearly enjoys playing this character but doesn't have much of chance to give any type of range. Sam Huntington brings the same ticks and twitchy style that he has used with other characters he has played, Syfy's Being Human is a perfect example. Here though his foibles add to the humor of the film and the chemistry between him and Routh keep the movie entertaining. What really may hurt this film is the oversaturation of the supernatural genre right now and the fact that Routh himself isn't much of a box office star so that may not turn into a large end-of-the-weekend box office. So for an early start to the summer blockbuster rush Dylan Dog is a good way to start but nothing to get excited over. Dylan Dog: Dead of Night images © Hyde Park, Platinum Studios, Freestyle Releasing. All Rights Reserved.